Far away, up and over the hills, there was a woman who made magic come to life. She sunk her hands into the ground and life came up. She took paint and brush to paper and images came to life, sweet children, gamboling dogs and heady masses of flowers. The flowers followed her wherever she went. 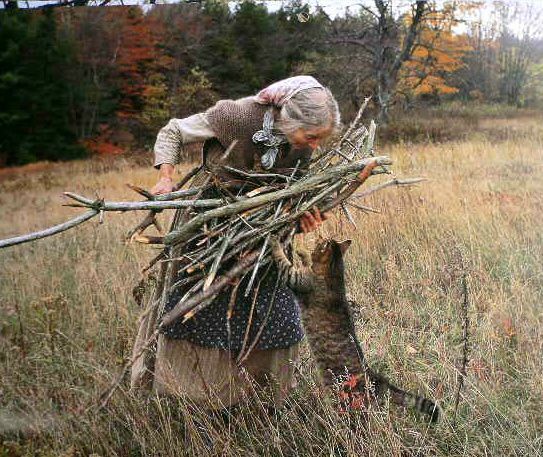 Tasha Tudor was committed to her own way of life and she was determined to live it with all the will she could muster out of her body and mind. She turned back the clock and lived in the era she wanted to live in. She wove blankets, knitted socks, hauled water, cooked in a wood burning stove, made candles to light her winters, milked her goats, dyed her yarn, only wore dresses and threw lavish celebrations. And while this was going on, she painted pictures and sold them. Some were put into books and told children’s stories. I came to know her at the start of my teenage years. I too longed to dress from an older times. I longed to live on a farm and feed my chickens, be followed by a flock of dogs. I longed to sit in front of a fire, reading books or making clothes, listening to the fire spurt and rustle. I longed to walk into my barn and bring down the hay for my horses, stepping through the sweet smelling straw while it snowed outside, cats curled into tiny bundles in the hayloft. Tasha came to me just as I was beginning to put these desires into words. A life I felt was lost to another time was being lived and it was happening now. 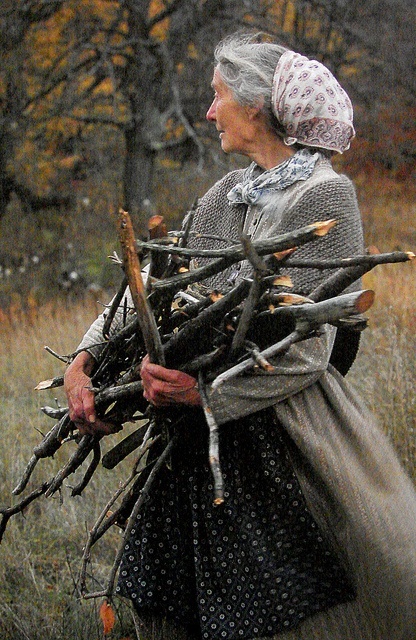 “The Private World of Tasha Tudor,” with Richard Brown’s gorgeous photos, awakened possibility and brought glimmers of hope. Like a fairy godmother, she popped up at difficult moments in my life. 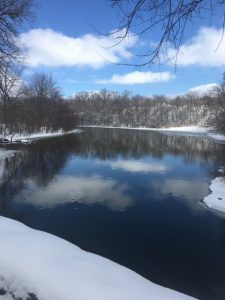 At one particularly difficult part of my life where I had lost all my bearings, where I had no idea who I was or what I should be doing and there was no one telling me what to do, she sprang up. She arrived in DVD form, “Take Joy!,” and I watched that DVD day after day for a few months. I can’t tell you exactly why I watched it so many times in a row but I watched very keenly, soaking up something that only the subconscious fully understood. I’m not entirely sure why I watched the video so many times. The most sense I’m able to make out of it now is that I was watching a woman who created her own life, her own standards and lived this life despite what anyone else had said or done to her. She was in the twilight of her life in the video, coming to the end of a long journey and relishing it all. Her way was so different, so obvious, so blatant, so unapologetic that like a hungry tired plant, I sucked it all in. I never knew Tasha the woman but I did know her as the artist and as a role model. 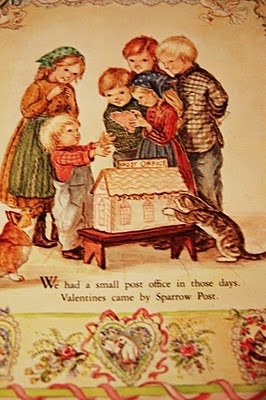 The title of my blog, Sparrow Post, is a tribute to the wonderful post office she fashioned for her own children, constructed out of cardboard and paint. The postmaster was a sparrow and he had a room in the back, where he could sort mail uninterrupted. Dolls and stuffed animals posted their letters and parcels at the office and I can only imagine the play must have been intense. It fired my imagination in a brilliant storm the moment I read about it and while I have yet to make my own post office, complete with sparrow postmaster, I wanted to invoke the same whimsy, the same delight in the small things in life, in the play and the imagination that comes when we feel free. This is the space I’m creating in this blog and I want to thank you for reading and joining me. Please read about Tasha Tudor, she really was incredible and if you feel stirred to create a story, a picture or whatever your medium is after reading this or reading about her, please share. I would love to see, honor and know your creation. Fantastic Catherine. It is a comfort to read the credit you shine on Tasha. You speak to the aching longing she elicits in many, and articulate the deep subtleties of what we are missing. Perhaps the homesickness that is exposed by “a woman who lived her own life” is just the medicine needed. It is a wonderful standard to set your sights on, in your blog or elsewhere in life. Thank you for your homage to a rare soul. Until tonight, I didn’t know the origin of “Sparrow Post”. Thank you for sharing the story. Beautiful post about a wonderful woman. I had only known about her through magazines and books…now I must get my hands on that DVD! Thank you, dear Fir Maid! I wouldn’t have written it if you hadn’t mentioned it earlier. It also got me to stretch my mind and ferret out just what it is about Tasha that is so inspiring. Let’s be people who join the ranks of women living their own lives on their own terms! Aho! Felt good to articulate it. Thanks, Tina! I’d be happy to loan it to you. Of course I own a copy! I checked it so many times from the library I just had to do something about it. Thank you for the way in which you honor Tasha’s memory. She was also my role model in so many ways-as a supremely creative single mother- living her life fully, on her own terms, and also as a gardener…I always aspired to create the lush abandon that seemed to blossom around her, as a co-creator of celebrations and rituals, as a mother- honoring the wonder of childhood, as a lover of all things hand made, and of close kinship with animals, as an artist and in her aesthetics…it is a deep regret of mine that I never met her in person…I was just feeling the urgency to make the “pilgrimage” when she passed…but she lives on in us. Lovely to discover your Sparrow Post! Unfortunately I discovered Tasha Tudor after her passing. I was reading a gardening magazine and someone asked her what was her favorite flower of all she had. After a thoughtful pause she said, “whichever one I’m holding at the moment.” Bingo! I was hooked. I understood completely. After deciding to learn more about this seemingly kindred soul I searched her out in the internet. What books I found! And, I bought most of them. What I don’t have, I’m still procuring. In The Private World of Tasha Tudor I found we really were kindred souls. So sad to never get to meet her. But, in my little corner of the world I’m still carrying on the homemaking skills, (please, not ‘crafts’), that she so loved. Sewing, tatting, knitting, crocheting, cooking, raising most of what we eat, canning, and the list goes on. It’s good to know I’m not the only one that feels like I was born in the wrong century. After learning about Ms. Tudor, I embrace that part of myself even more. It’s good to be different.